In any accident, head injuries are most feared – Doctors do advise on taking a MRI or CT scan to find out the extent. Traumatic brain injury occurs when an external force traumatically injures the brain. Head injury usually refers to TBI, but is a broader category because it can involve damage to structures other than the brain, such as the scalp and skull. MRI is stated to be a painless, non-invasive procedure meaning the body is not tampered with in an way... the person undergoing would be asked to keep away all jewellery, even credit cards and metallic instruments. The person is put on a slab which goes inside the machine... 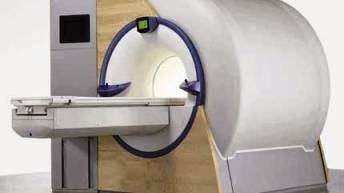 Magnetic resonance imaging (MRI) is a medical imaging technique used in radiology to investigate the anatomy and physiology of the body in both health and disease. MRI scanners use strong magnetic fields and radiowaves to form images of the body. The technique is widely used in hospitals for medical diagnosis, staging of disease and for follow-up without exposure toionizing radiation. MRI requires a magnetic field that is both strong and uniform. The field strength of the magnet is measured in tesla. ~ and when it is widely believed that MRI is done to find out the extent of an injury, here is the story of a woman who unfortunately was injured in the process of taking a MRI in Raipur, Chattisgarh, according to this report in TOI. A 34-year-old woman, Ram Kumari, was seriously injured in a freak accident that occurred in the MRI room of the Dr BR Ambedkar Hospital on Monday morning. Ram Kumari, who had undergone an MRI for her spinal fracture, got badly stuck in the machine and sustained serious injuries on her jaw and head when the metal stretcher brought in by her family to shift her literally became a projectile and hit the machine hard after being pulled in due to the heavy magnetic field around the machine. The mishap was a result of sheer negligence of the staff of the MRI room, as they directed the family to remove the patient from the machine without warning them about use of metallic objects near the machine. According to experts, modern day MRI machines have extremely powerful magnets in them, with powers ranging between 0.5-Tesla to 3.0-Teslaor 5,000 to 30,000 gauss (in contrast to Earth's mere 0.5-gauss magnetic field), and callous use of metallic objects around it can lead to disastrous consequences. Despite the fact that use of metallic objects is banned in MRI rooms, the staff present there callously directed the patient's family to remove her from the machine rather than doing it themselves. Unaware of this fact, Ram Kumari's family members brought in the metallic stretcher to shift her out and it got pulled into the machine. By the impact of the collision, Ram Kumari, who was still on the machine, got stuck into it and sustained injuries on her jaw and head. According to eyewitnesses, her face and head literally got glued to the machine, leading to fractures. Eyewitnesses revealed that the two technicians who did the MRI, walked out of the room after the procedure, directing the patient's husband to remove her from the machine. They did not even warn them about the use of stretcher or gave them any direction about safely removing her from the machine. None of the technicians were reportedly present in the room when the mishap occurred. According to doctors attending on Ram Kumari, though no serious injuries were found on her head, her cheekbone had sustained a fracture. Her condition is reported to be serious. Talking to TOI, Pratap Singh, director medical education (DME) said that three hospital staff including MRI consultant, Dr Anand Jaiswal and two technicians, Devesh Patel and Abdul Khalid have been suspended. Dr Vivek Choudhary, medical superintendent of Dr BR Ambedkar Hospital, admitted before the media that the mishap was the result of the sheer negligence of the hospital staff. The machine reportedly costs 12 crores. Reflecting the fundamental importance and applicability of MRI in medicine, Paul Lauterbur of the University of Illinois at Urbana-Champaign and Sir Peter Mansfield of the University of Nottingham were awarded the 2003 Nobel Prize in Physiology or Medicine for their "discoveries concerning magnetic resonance imaging". The Nobel citation acknowledged Lauterbur's insight of using magnetic field gradients to determine spatial localization, a discovery that allowed rapid acquisition of 2D images. The award was vigorously protested by Raymond Vahan Damadian, founder of FONAR Corporation, who claimed that he invented the MRI and that Lauterbur and Mansfield had merely refined the technology. A group called "The Friends of Raymond Damadian" took out full-page advertisements in the New York Times and The Washington Post entitled "The Shameful Wrong That Must Be Righted", demanding that he be awarded at least a share of the Nobel Prize. Top Private Hospitals in Pune is intricate in directing microscopic, bacteriological and chemical tests in labs. It is a specialization in medication that offers a base for medical practices.